To effectively tackle the skills shortage a long-term campaign is needed to raise awareness of Electronics among schoolchildren. The UKESF is taking this challenge on with an ever-expanding programme of exciting Electronics activities, inspiring students about Electronics at school and encouraging them to pursue STEM subjects through to A-level. We provide opportunities for Electronics companies to engage with children. With our help, employers can help to shape their employees of tomorrow and benefit the sector as a whole. Companies can make a real difference and help promote Electronics in schools by supporting our Electronics Everywhere project. With your support, we want to provide an opportunity for children to develop their interest in Electronics and engineering, through the school curriculum, in schools across the UK. Click here to find out how you can make a real difference and help promote Electronics at schools by supporting this project, or email info@ukesf.org to register your interest. 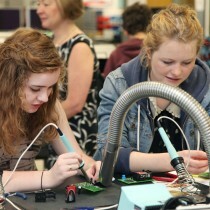 The UKESF sponsors an annual EDT Headstart Summer School aimed at STEM-focused 16–17 year olds, which is delivered in partnership with sponsors and speakers from the Electronics sector and academics from leading universities. The residential 5-day course is hosted by a different partner university each year and gives students a taster of degree study and careers in Electronics ahead of making their UCAS applications. So far, 10 participants in the UKESF-Headstart Summer School have subsequently been awarded a UKESF Scholarship. Find out more here. Companies can contribute speakers (particularly young engineers who have recently graduated), deliver hands-on Electronics challenges and host visits. Email info@ukesf.org to register your interest. Read the most recent Summer School news story here.